“आशु भाई , GPS देना ज़रा ?” said he. “क्यों , इतनी सुबह GPS क्या करना है ?” – I was trying to muster the courage to actually open my eyes. “थोडा Glacier तक जा के आना है.” Prof Mal replied. Suraj has this inexplicable bonding with Glaciers and Glacier snouts; exactly like Arun Negi has his with snow leopards. These are subjects of passion for them and they would go to any length to pursue these passions even in the toughest terrain, weather or physical condition. “आप लोग trek शुरू करने से पहले ही मैं आ जाऊँगा, 08:30 तक.” He added and set off for the snout of the Girthi Glacier. When all of us finally woke up to a glorious morning, Suraj was long gone with another porter towards the direction where a tall fluted ridge of the Kholi was visible to the left. With tufts of baby clouds variously dotted all over, it looked majestic in the golden sun. The frustrating roller coaster ride of the trail was now over. It rose sharply for some 250 meters to reach Girthi Top- well marked by a large Cairn and a pennant. Climbing a further 50 meters we reached a large meadow, through which lay the gently rising trail. The snowcapped mountains defining the Topidunga area were shining far ahead. It was ‘Showtime!” in the Himalayas J. The Mountain had turned its charm on. The challenges were over for a while; it was time to enjoy the beauty! 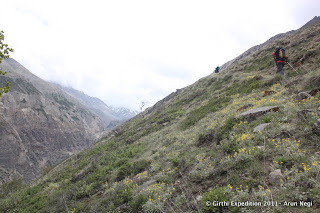 For kilometers, a green carpet laid spread out with little dots of monsoon blossoms; of yellow, white and orange hues. That’s when we realized that we were thirsty and were running short on our water supplies. The issue was more pronounced for the porters who usually do not carry the sophisticated water-sacks like we do. To our relief, after five hours of trek since Girthi, we found finally, a gurgling stream of water. 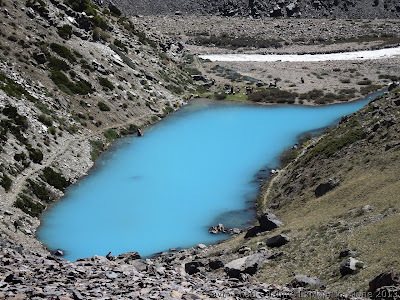 Ahead lay a beautiful meadow with a dead glacier adorning one of its extremities. 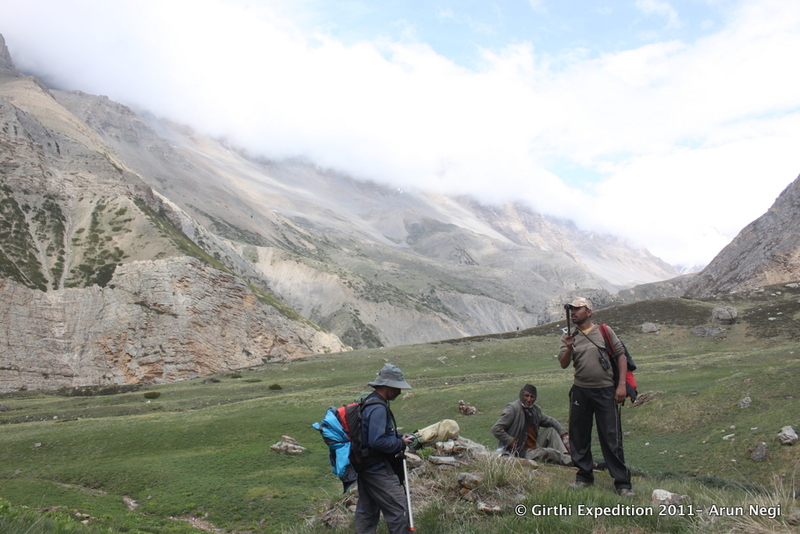 We had reached the midpoint between Girthi and Topidunga- The Malla Kanda Camping ground. Walking into the meadow, we came across some animal droppings that looked like that of some predator..probably feline. "बघीरा का होगा सर.." said Jaisingh after some careful contemplation. The droppings had components such as hair and crushed bones which indicated it belonged to the carnivora. The area looked well used by shepherds with more than one shelters visible in that vast meadow. The grassy flat well watered by a maze of streams flowing through. Almost at the entry point stood a strange large hemispherical rock with a verdant green all around. It was almost as if someone had just lifted the finely sculpted rock from somewhere and placed it there. We christened it ‘The Stupa rock”, due to its resemblance to a Buddhist Stupa. It was too early to camp, yet we weren’t sure of availability of a campsite ahead. Even old Bhuwan was of not much help. “येहिं तक आया हूँ मैं साब..पहले..फिर Topidunga से आगे का रास्ता पता है.. बस बीच का दो-चार किलोमीटर देखा नहीं है ..”- He admitted. Apparently he had come with his flocks till this point and after a gap of few kilometers, he knew the path from Topidunga onwards. “Campsite है सर यहाँ , पानी भी अच्छा है”. Referring to the GPS map, one could guess this potential campsite to be slightly short of – what’s indicated as “Matoli CG”. After a short climb we reached a meadow across a fast flowing river, very close to a Glacier that was almost invisible with settling clouds. We were at the highest point yet- at 4400 Meters. The wide meadow on the banks of the stream was dotted with Juniper bushes, orange blossoms and little nests of “Phia”. The burrows look like that of rats– but little more sophisticated architecturally, with a small portico and a resting perch. The mountain folks consider the marmot a precious commodity because its body fat is supposed to have medicinal properties that can cure chronic arthritis and rheumatism! After much fighting with the Juniper bushes, we could gather enough of those leaves and twigs to start a fragrant campfire. At heights above 4000 mtrs where larger plants cease to exist, the Juniper is nature’s gift for creating a fire because of the rich resins contained in its green leaves. The added advantage is the fragrant smoke it creates; one reason why they are extensively used as incense in Buddhist Monasteries. We had finished setting up the camp when the winds rose and the campsite was engulfed in a cloudy whiteout followed by a light drizzle. The rains continued throughout the night causing much anxiety in our minds. We desperately wanted the weather gods to be on our side. We were about to enter the snow kingdom, which lay beyond the tall ridge to the east of our camp.